Using a central heat pump (CHP) is an energy-efficient way to both heat and cool your home. Compared with electric resistance heating such as a furnace or baseboard heaters, a CHP can reduce your electricity use for heating by 25-50%. That can add up to big savings on your utility bill. A CHP uses an outdoor compressor that is connected to a furnace that pushes air through ducts in your home and out of the vents in your rooms. The temperature is controlled by a single thermostat. During colder months, a CHP supplies even and consistent heat while using less electricity than other electric heating options. In the warmer months, the system keeps your home cool and comfortable while also dehumidifying the air. 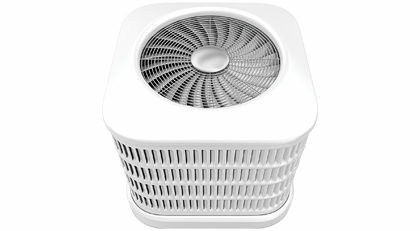 Plus, its built-in air filter helps improve indoor air quality. We offer eligible property owners a $1,000 rebate towards the purchase and installation of a qualifying high-efficiency CHP when replacing an existing electric forced air furnace. To help you purchase a CHP, we offer a seven-year, zero-interest loan for owner-occupied homes and residential rental properties up to four units. The maximum loan amount is $10,000 and the monthly loan payment is about $120. Zero-interest loan recipients are not eligible for a CHP rebate. Eligible properties include owner-occupied homes and rental properties up to 4 units. If the total cost exceeds the loan amount, you are responsible for any remaining balance.